You'll notice my content is definitely going quite seasonal at the moment, and rightly so because winter is truly here with the bitter coldness we're experiencing. With that comes us dry skin gals battling a constant fight to keep our skin from looking like a flakey mess on a daily, so here my four products i'm relying on at the moment. 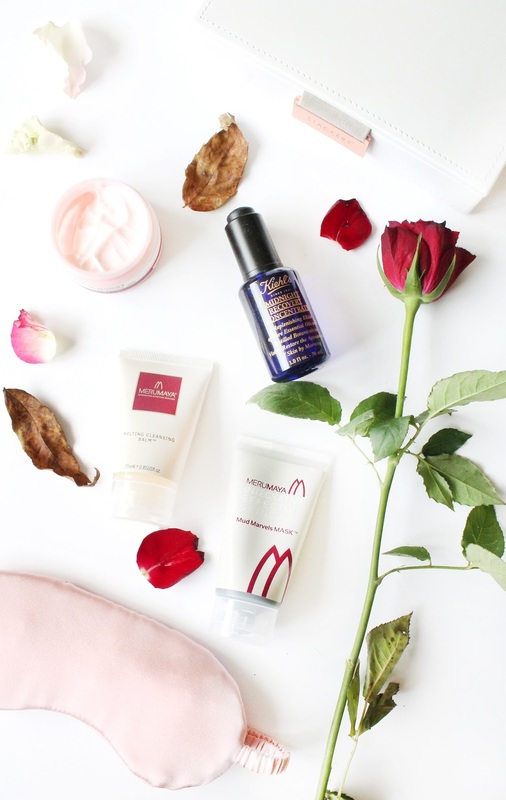 One skincare product that I never used to use was an oil, but since beginning blogging i've added a fair few into my skincare routine but hands down my favourite and most recommended has got to be the Kiehls Midnight Recovery Concentrate (£39). I picked this up from duty free back in Feb and I used it a lot towards the end of winter and into spring but during summer my skin didn't need this product, but as we now move back into winter my skin is lapping this up. Using this of a night before going to sleep leaves my skin feeling less dry and looking a lot more hydrated. I notice that when I don't use this that my skin just feels stiff and so dry, so i'd definitely recommend trying this one out! A skincare brand that I absolutely love it MeruMaya as their products just work wonders on my skin, especially when it comes to their spot treatments. Recently they sent over a little bundle to celebrate their 5th birthday and i've been loving a few of the products so I thought i'd share them with you. If you're a lover of balm style cleansers then you'll love their Melting Cleansing Balm* (£17.50) and it's amazing for skin all skin types as it works in many ways. It not only hydrates the skin and leaves it feeling smooth but it also works as an anti-oxidant to combat the effects of harmful pollution. I typically use this of an evening and it just melts away my makeup and leaves my skin feeling amazing! Another product that i've been loving is their Mud Marvels Mask* (£19.50) as this works wonders when i've got a few blemishes hanging around. It's also amazing for those with oily skin as it helps to balance out oil levels without completely stripping the skin which most masks targeted towards oily skin can do! I use this once or twice a week and it's amazing at just giving my skin a good cleanse and detox. Finally one product I always rely on at this time of year is The Body Shop Vitamin E Intense Face Cream (£14) which is a saviour for dry skin during the winter months, but it also works amazingly for most skin types so i've heard. This cream works to protect, nourish and lock in moisture often lost from the skins natural barrier. I typically apply this of an evening as I do find it can be a bit heavy for day use, and when I wake up my skin looks nourished and feels absolutely amazing! I've used this for a few years now and have repurchased over and over, so i'd highly recommend. What skincare are you reaching for this winter?